There is no question – you trust medical professionals for everything else. Get vaccinated! As straightforward a message as can be: VACCINATE! A: If you’re unsure whether you’re immune to measles, you should first try to find your vaccination records or documentation of measles immunity. If you do not have written documentation of measles immunity, you should get vaccinated with measles-mumps-rubella (MMR) vaccine. Another option is to have a doctor test your blood to determine whether you’re immune. But this option is likely to cost more and will take two doctor’s visits. There is no harm in getting another dose of MMR vaccine if you may already be immune to measles (or mumps or rubella). Dr. Bulmash of Boro PArk, where are you? 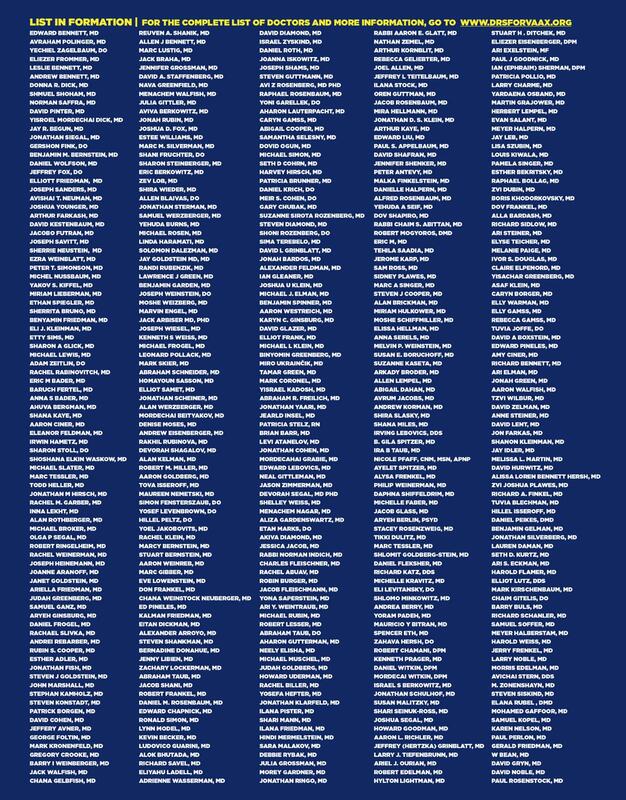 You are not on this list yet… Some Boro Park pediatricians are still critically missing. Drs. 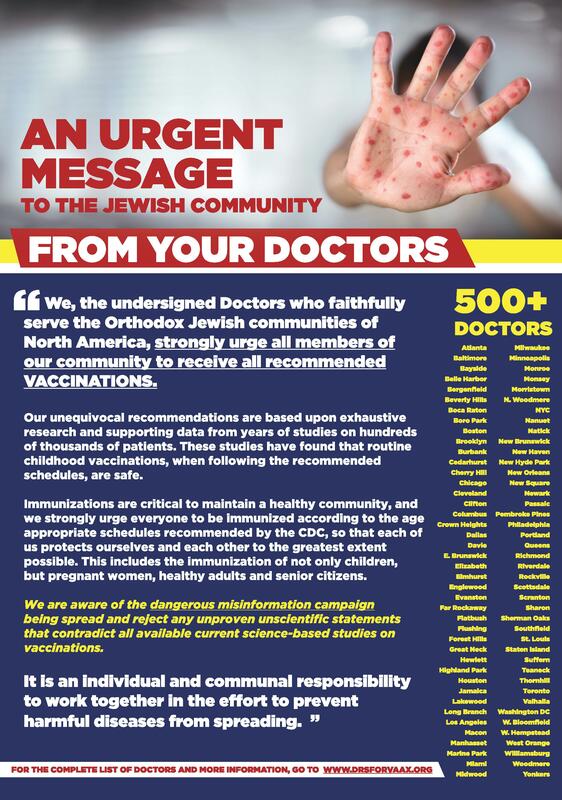 Bulmash and Roth you should be on this list… AS well as Dr. Rajaram and Dr. Sasha Abram, both who service some of the anti-vaxxers in the Boro Park community. Meaningless. If there are no placebo studies how can you say it’s not causing the rise we see in allergies, athsma etc?! There’s no placebo studies because anyone with half a brain gets the vaccine. This isn’t a weight loss pill, its a matter of life and death. This isn’t complicated science. Every normal doctor in the world has said to get the vaccine. Literally every single doctor. Unless I am mistaken anyone can put any doctor’s name on that site. Doesnt seem as legit as it should be that the dr’s signed the declaration. What order are the names? It’s not alphabetical. Its hard to see who is or isn’t on the list. So would you care to present us with your credentials as to how you know all scientific literature that enables you make such a blanket statement as “there are no placebo studies”? Now, please give us you source. If Moshe Rabenu told vaccine your children, would you? It won’t make a difference with this epidemic! 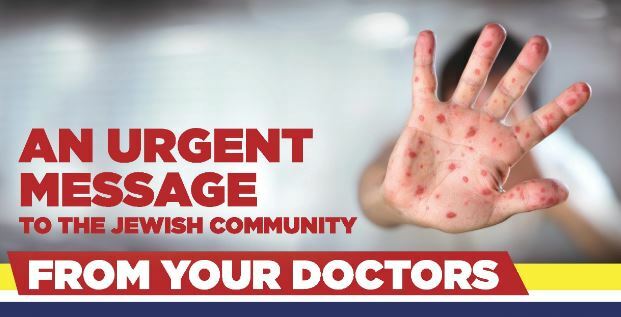 The only thing that will make a difference is – if all the Rabbonim & all the schools get behind the Vaccine movement. We have so many שונאים in the world, why must we do stupid things and develop yet more שונאים. How can parents out their children and others at risk! My question is is there a test to see if the vaccine I got is still effective? How can I know? @Yiddeshe Tuchter – every doctor was vetted before being allowed onto the group. Unlike the anti-vaxxers who regularly use the names of Rabbonim in their pack of lies. Like last night in a robocall. In my opinion it’s worth it to get vaccinated just because if yaapchiks point. You can take the “Titer Test”. It will show you if you are still immune to the disease. It’s a fairly simple and quick blood test. As your doctor. Israeli doctors need to do the same. There is a blood test that tells you if you are still immune to it. I’m sorry if I aggravated anyone, but do the research. Hey, so basically they are now saying that the concept of Herd Immunity does not exist? The ‘herd’ is not protected- with so many vaccinated adults walking around without immunity. I always felt an obligation to vaccinate to protect the ‘herd’. But if such a large percentage of adults are not immune, why are we so worried about a small percentage of unvaccinated kids? If childhood vaccines don’t provide a blanket ‘herd immunity’ to the community, then it’s ‘every man for himself’- you don’t want measles, get the shot- you don’t mind measles, then don’t get it. I am a medical school professor but with a PhD in Biostatistics, not an MD. I endorse this message. @only the truth, how can allergies or asthama be compared to measles with all its complications or even death??? Give the vaccines! Halacha mandates we should.then trust in Hashem that following torah guidelines will keep us all healthy.Either way we need to trust Him to keep our families safe and healthy so follow psak halacha of rav zinner and many other rabbonim and do the right thing ,VACCINATE! What will it take for you to vaccine your children? How many deaths? How many children with permanent injury? How many doctors? How many Rabbis? Will it take a prophecy from HaShem Himself? Of course I did the research and it proves, in all but medical reasons, your are OBLIGATED al pe Halacha to get vaccinated. Other than that, are you an Orthodox Jew? Please do not tell me that I hate other Jews, I am just saying my halachic analysis. WE DID! Maybe you Antivaxxers should do some Soul Searching?!? @Some Common Sense, “I am just saying my halachic analysis” halacha mandates that you hear both sides of the argument from both sides, not that you both sides of the argument from one side. What is your argument? what is your basis for being on your side of the vax/anti vax position. I have seen the medical proof, the studies, the halachic statements all pro vacinate. Can you please share a website? a video? a lecture? something that validates anti vaxers positions? What do you consider ‘the other side’. There has been an extensive discussion on the ywn coffee room, many anti vaaxers tried really hard to repeat the nonsense of ‘the other side’ yet every claim was satisfied and their lies exposed. Do you think I’m an Am HaEretz? Of course, I heard both sides and after that, my previous statement stands. So, now you answer my question: what will it take for you to vaccinate your children and grandchildren? @Some Common Sense, very simple. A study comparing vaccinated vs. unvaccinated children. by the way why are people scared of measles death- i am sure that my parents dont know anyone who died of measles- hafuch- they adn all their friends had measles. again- if you have it as a kid you are not in danger as an adult. davka when i hear stories of adults who are really sick with measles i wish my kdis could get them now and not be immune and then in 30 years have the affects of the vaccine wear off and get it as an adult. just somemore food for thought. My wife signed the letter but they have not added her to the list yet.